This sweater was a few months in the making as honestly, I found the pattern a bit boring, and frankly, I hate twisted stitches. But the final project turned out pretty good and the colour is perfect for my nephew Z, who has hazel eyes. Notes: The decreases took much longer than expected (27 decreases over 54 rounds). Notes: this pattern had some errata that I had to work out, plus I made a bunch of alterations as well. 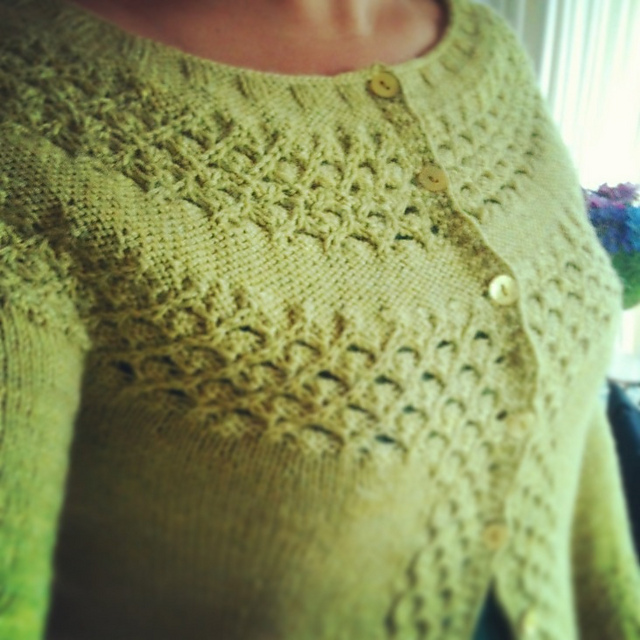 My notes can be found on my Ravelry project page for full details. 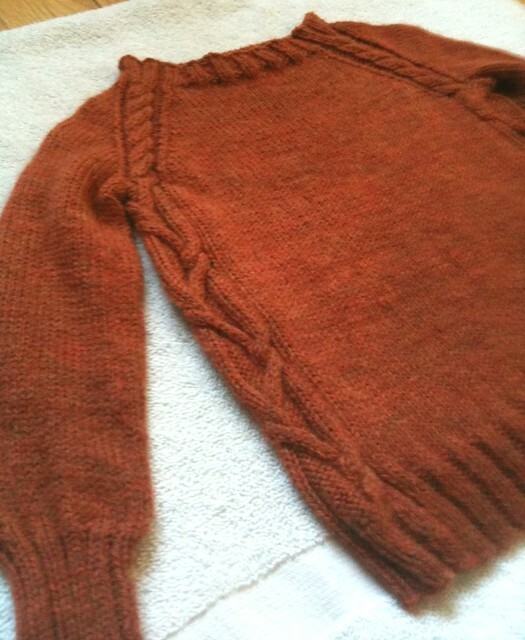 (On a sadder note, the nephew that this sweater was intended for unfortunately passed away the week before Christmas. I gave this sweater to his big brother Z as he will be able to wear this sweater for a while before he grows out of it. 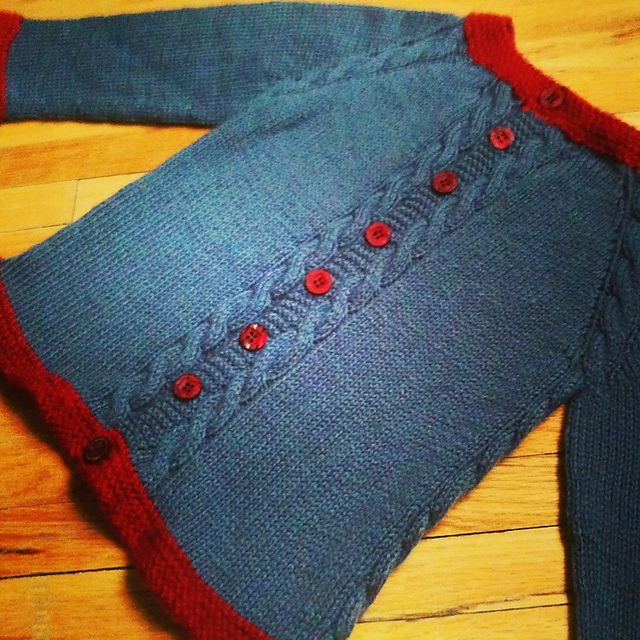 I’m currently in a state of mourning, but wanted to share this project as it was dear to my heart and a lovely knit). Notes: forgot to mirror the cables on the front, but ah well. 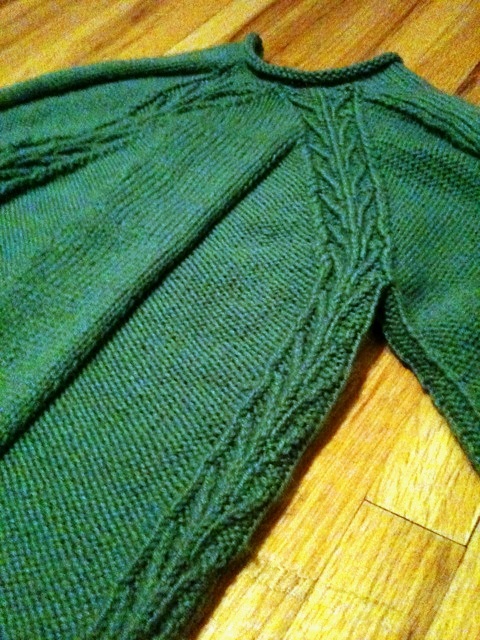 Also did a cable down both side “seams” (wasn’t noted in the pattern but I liked the look of it). I sewed snaps into the back of the buttons because I wasn’t in the mood for making button-holes. Snaps also make squirming toddlers easier to dress. Did all the garter areas in contrasting colour. This cardigan looks great on my littlest nephew R, who looks like quite the little man in it. Changing track – a cardigan for me! About a year ago I started the Talamh Cardigan for myself (see this blog post mentioning it) but I never got around to writing about it. Why? Because after about 5 months of knitting the thing, when I put it on, I hated how it looked on me. The front gaped open over the bust, the shoulders just didn’t look right, and I wasn’t sure about the fit. And so it sat on my couch. And sat. And sat some more until I finally showed it to a few friends of mine that convinced me it wasn’t nearly as bad as I was imagining. One of my knitting friends offered some advice, and I thought about it and decided to add a bit more fabric to the button-bands by doing some single-crochet. It helped, but the cardigan still gaped open over the bust. And so this cardigan sat for another 3 months on my couch, taunting me with my failure as a knitter. I ignored the cardigan and focused on the nephew Christmas sweaters. Finally, over the holidays, I sewed some hooks/eyes onto the button band and that seems to have dealt with the gaping issue. I’m still not 100% happy with the way the cardigan sits on my shoulders/collarbone as I’m really narrow across the shoulder, but its wearable now at least. Notes: to be found on my corresponding Ravelry project page as there’s lots! On a final note, I’ve knitted about 4000 yards of yarn in 2013. Huzzah! You are currently reading Sweater Round-Up at When Gaia Smiles.